One of the best complements we can give to anyone is to call him or her Our Teacher. Stephen Covey was and will remain a teacher of mine. I have never met Mr. Covey and sadly never will. He died today. He was 79 years old and died from injuries from a bicycle accident. He remained vibrate to the end writing books, speaking around the world, and teaching at the business school of Utah State. I suspect the students attending the business school at Utah State received an education equal, if not better, than a place like Harvard due to their teacher, Stephen Covey. Stephen Covey, if you are not aware, wrote the book “The 7 Habits of Highly Effective People“. By many influential sources, it is one of the top business and personal effectiveness books ever. If you have never read this important book, do. If you read it years ago, read it again. That is my plan in his honor. I have read other books written by Stephen Covey. These include “Principle-Centered Leadership”, “First Things First” and “The 8th Habit”. I have learned much from each of these books. Here, briefly is one learning from each of these books. I invite you to explore for yourself each of these books and other writings by Stephen Covey. From 7 Habits, I learned – How to recognize my Circle of Influence. That is where I need to operate. From there I work to expand my Circle of Influence. From Principle-Centered Leadership, I learned – A leader is continually learning. The more I know, the more I do not know. As my circle of knowledge grows, ignorance gets absorbed. From First Things First, I learned – Look at your work in units of one week. Change your Outlook Calendar to show a full week of appointments and tasks. We start the week with planning and end it in reflection. We then continue the cycle. From the 8th Habit, I learned – The 4 roles of leadership: Vision, Discipline, Passion and Conscience. In today’s news, CNN placed the story of Stephen Covey’s death in the Entertainment section. They considered him to be a writer and that is it. He was much more. This is national and even international news. An important voice went quiet today and the world should stand up and notice. 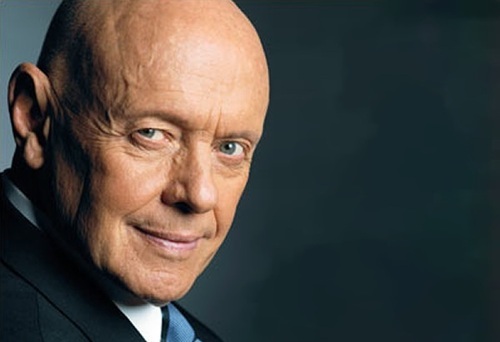 Rest in Peace Stephen Covey … a teacher, my teacher. Here is just one of many videos of Stephen Covey speaking. He is talking about an important artifact, The Talking Stick. I have a version in my office sitting on my conference table waiting for its moment.